Digital Rain Gauge Improves Upon The Graduated Cylinder | OhGizmo! Outside of scientific and research applications, I’m not really sure why someone would need a rain gauge at home. I guess a farmer might like to keep tabs on how much water their crop is getting, but knowing how much rain fell last month just seems like a boring conversation starter. On the other hand, who am I to pass up anything with an LCD? 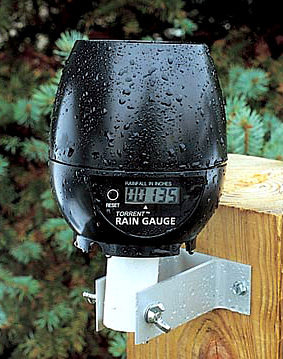 This Wireless Digital Rain Gauge (wireless because it runs on a single AA battery) is accurate to a thousandth of an inch (0.001) of rainfall and includes an LCD display that’s readable from up to 10 feet away. The Digital Rain Gauge is also self-emptying since the water droplets are measured as they flow through the device and exit out the bottom. The rain isn’t actually collected, which means you never have to empty it out and there’s no risk of it freezing up overnight. It also features a one-touch reset button allowing you to track rainfall over a set period of time, or on a storm-by-storm basis. You can get if from Sporty’s Tool Shop for $59.95. Realize or not, watering plants can cause devastating effects on your water bill but one invention can help you to overcome this problem and manage your water effectively. It’s the rain gauge.